Our family's hearty minestrone soup recipe always goes down well. It's truly a one pot meal prepared in a flash. It's not just quick but it is also simple to prepare and full of goodness. This is a one pot meal. 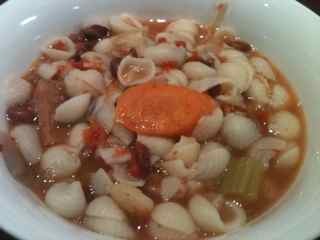 This minestrone soup recipe is a wholesome one pot meal with carbohydrates from the pasta, protein from the meat and beans and its full of vegetables, all cooked in tasty chicken stock. If you are freezing the surplus, remove the potatoes as potatoes don't freeze well.